BELLY UP TO THE ACCOLADE BAR. Lynn McDonough, owner of Connell’s Supper Club and Connell’s Club 12 (shown here), took home this year’s prestigious trophy as Wisconsin’s Restaurateur of the Year. Lynn McDonough has been running Connell’s Supper Club for over 25 years, so he definitely knows a thing or two about the business. Also, the Wisconsin Restaurant Association just named him Restaurateur Of The Year, a huge award from the entire state. 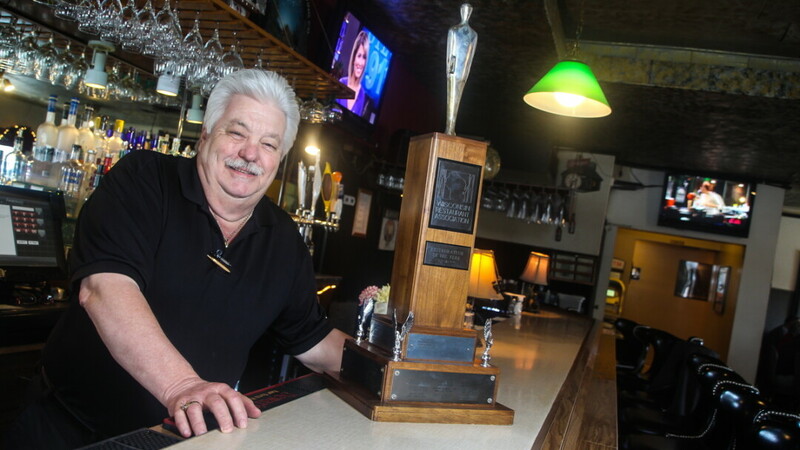 We recently caught up with McDonough to talk about his huge trophy and what makes Connell’s a local (and now statewide) treasure. V1: Can you start out by talking about your career and how you got to where you are now? Lynn McDonough: I started out in the tavern business when I was 21 and I just kept working up other jobs until I managed a gas station. I ran a bowling alley and golf course for a while as well. Then in 1988, I bought my first restaurant. Why did you decide on a restaurant business? It was kind of a coincidence the way it happened. The business came up for sale and my friends wanted me to look at it and to see if I could buy it. That’s pretty much how I got into it. What do you enjoy most about the restaurant business? The patrons, the guests, and the employees are all great. How does it feel, receiving this award? It’s quite an honor. You know, it happens once a year and you get picked by your friends in the restaurant business who have had this award before. They make the judgement on who is going to get it. Absolutely. I didn’t know anything about it, but that’s how it works. Just sitting there and a guy is reading a biography type thing and I start thinking, ‘that sounds like me.’ You’ve got around 400 people there, the spotlights came on, and I had to get up and do some speaking. I’m not a speaker, but I got by with it. Why do you think Connell’s deserved to win? Well, it’s not the restaurant as much as it is the restaurateur. For doing extra things with the restaurant association and working quite a bit with the education foundation so we can get other people involved. I was part of the effort to rejuvenate our chapter of the Eau Claire area. There wasn’t really one and it had died off. A couple of other people and I started putting it together and our chapter has donated almost $40,000 in the last ten years. Running a golf tournament for the education foundation and things like that. I’m sure it helped it a lot. It was on Facebook and I’m not a Facebook person, but some of my employees put it on there. I guess it got quite a few hits. It’s just something that doesn’t happen very often; it always seems to happen in the bigger cities like Milwaukee. We work hard up here too just like they do down there. It’s kind of fun having someone from up here getting this award. I really like local restaurants rather than the chains, and family style restaurants are starting to drop off. It’s getting harder to compete with the chains. Why would you say Connell’s is an important part of the Chippewa Valley? We’ve been in business here for 27 years and we’ve had a lot of great guests. People really enjoy coming to our restaurants. I’ve had eight or nine restaurants in the past 26 years. We meet a lot nice guests; we meet a lot of nice people. It’s amazing how many people you meet in the restaurant business. I’ve put a lot of kids through school; giving high school kids a job and helping them in that way. I have a lot of employees who have been with me for a long time. Do you have any final thoughts on winning this award? It was a huge surprise and a great honor. It’s amazing how you get to know people in the restaurant business; fellow restaurateurs in Milwaukee, Green Bay, Oshkosh and Fond du Lac. Meeting all these people, being in meetings with them, it’s amazing how much friendship you get in the Wisconsin Restaurant Association and I really enjoy trying to help kids out by getting them into our business more. People sometimes believe the restaurant business isn’t the greatest job in the world, but obviously it is. It’s not the perfect job but no job is prefect. It’s a way to get started and if you work hard enough you can be successful. There are a lot of people who started out being dish washers and end up owning their own restaurant.